Stephen Williams learned about ADUs because he has worked in the construction industry for more than forty years. A designer by training, Stephen founded Rainbow Valley Design & Construction in 1971 when he teamed up with a group of carpenters. Stephen has always enjoyed the challenge of making a small space functional and comfortable. He had already built two ADUs, so it made sense that he would build an ADU on his own property when the opportunity arose. In 1998, Stephen purchased a lot in the Foster-Powell neighborhood with an existing house, which had been condemned. He remodeled the 1908 home and rented it out. He then designed an ADU for the back half of the lot, abutting the alley. There are no setbacks required from an alley, which enabled Stephen to retain more of the backyard than he would have been able to if the property line was shared with a neighboring house. Since it is a dead-end alley, it’s very quiet, but it provides excellent access to the ADU. Although rental income was the primary factor influencing Stephen’s decision to build an ADU, he knew that the ADU could also be a showpiece for Rainbow Valley‘s work. 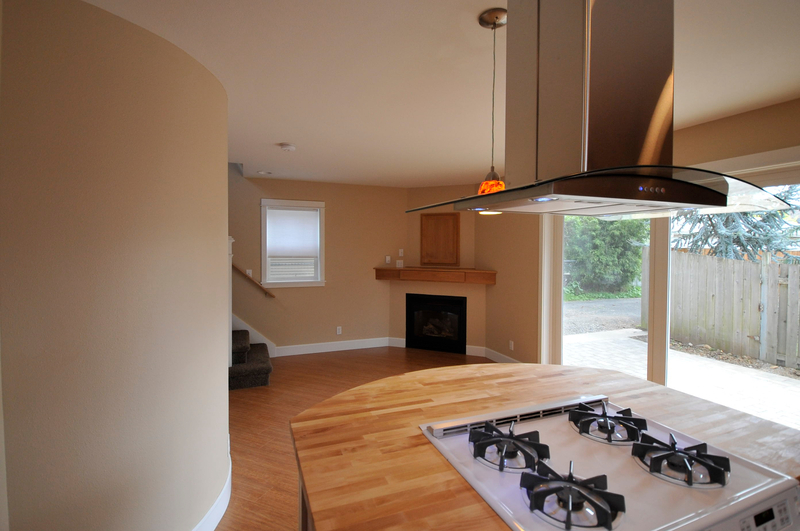 Stephen took out a home equity line of credit (HELOC) on his own home to finance construction of the ADU. 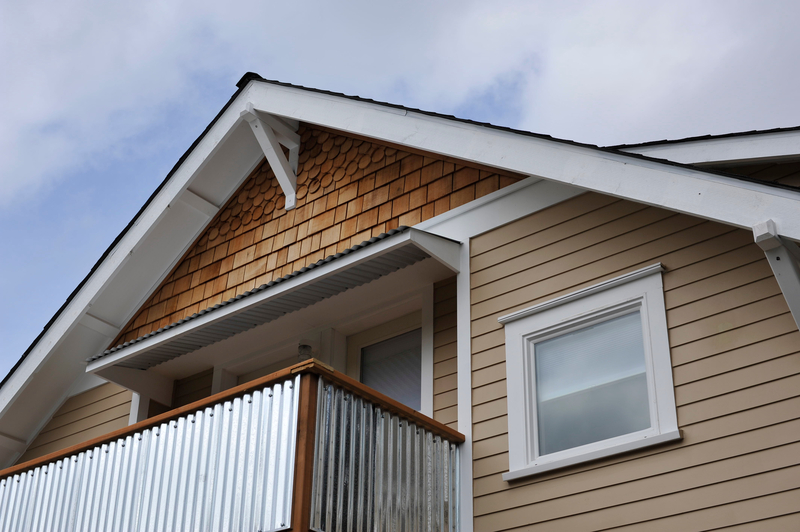 Portland’s design guidelines for ADUs require that the ADU match the primary dwelling in roof pitch and finish materials. However, Stephen was not particularly impressed by the exterior finish materials on the existing home and didn’t want to replicate them on the ADU. So he refinished the exterior of the primary dwelling prior to submitting a request for the ADU building permit. The biggest design challenge was how to get services to the ADU. There was barely enough drop for the sewer line, but Stephen figured out how to make it work. Meanwhile, the electric company wanted Stephen to pay for the installation and maintenance of a power pole or to pay for undergrounding of the power supply. Both options were cost prohibitive, so Stephen tied the ADU into the electrical system in the main house and put a meter at the primary dwelling. Each month, Stephen reads the meter to divvy up the electrical bill, and he tacks the ADU tenant’s share onto the amount of rent due that month. Stephen says it’s not quite as convenient as having the two units metered separately, but it’s working fine. Stephen encountered another design challenge in the roof design. He wanted to use dormers to maximize the space inside the second story. He was planning to run the dormers from the ridge beam since it would make the roof simpler to construct and would provide less opportunity for water infiltration, which could damage the structure. 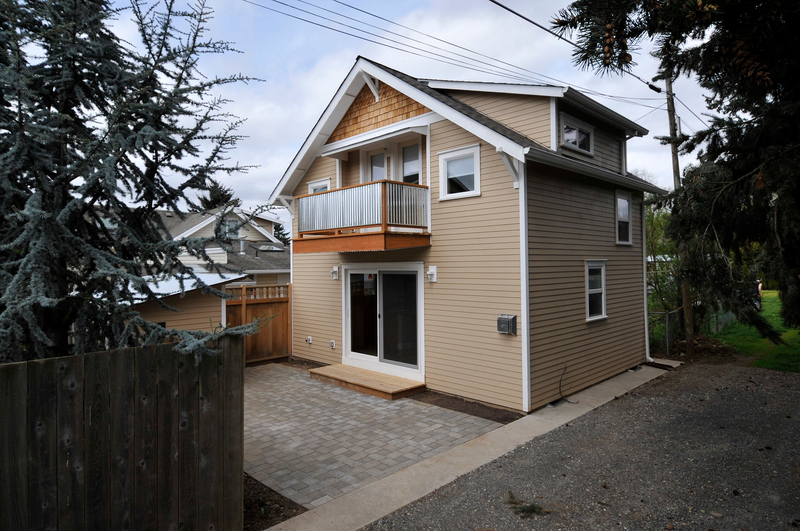 However, in Portland the height limit for an ADU is 18 feet, measured at the midpoint of the roof pitch. If the dormer starts at the peak, the midpoint of the dormer (which is higher) would be used for the calculation instead of the midpoint of the main roof pitch (which is lower). So Stephen ended up dropping the dormers down just a few inches from the main roof pitch so that the height of the building would be measured from the midpoint of the main roof. Stephen included several special features to give this small house character. Stephen’s favorite aspects are the natural light, the private courtyard patio, the gas fireplace, the big kitchen, and the curved bathroom wall. He was also conscientious about storage space, so he added a cabinet under the stairs and included storage lofts in the bedrooms. Stephen feels there is enough storage, but he says if he had it to do over again, he might go up to the 800 square foot limit allowed for ADUs in Portland to create a bit more space overall. Once it was completed, Stephen rented the ADU out to tenant who has since become friends with the tenants in the primary dwelling. Unlike many other cities, Portland does not have an owner occupancy requirement for either the primary dwelling or the ADU, which means that an owner can choose to rent out both units. 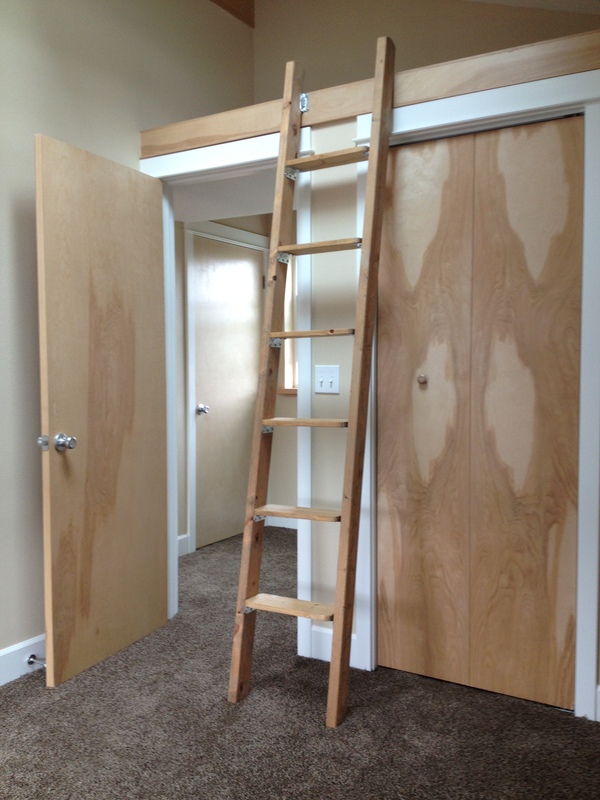 (See Rex Burkholder’s ADU: Own Two, Rent Both for another example of this arrangement.) Stephen says that the arrangement is working excellently for him and his tenants. 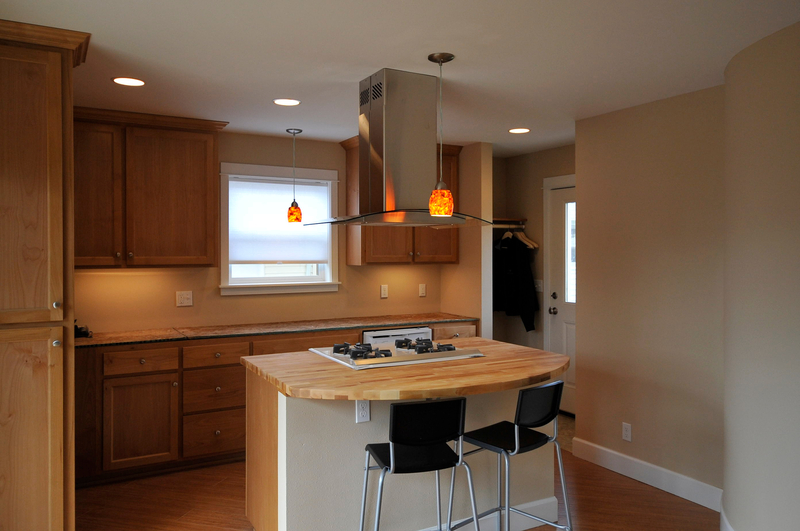 Stephen’s ADU has been featured on an ADU Tour and will be on display again in 2014. Stay tuned for details! Stephen’s advice for homeowners considering creating an ADU on their property? Thank you for these great case studies! A very important source of information. Thank you for your comment, Sue! We’re glad you’re finding the ADU case studies helpful. 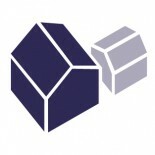 Please subscribe to AccessoryDwellings.org to receive notification of a new case study each week! Is that shed there near the patio for bike parking? A nice idea in Portland. Yes, Martin, that is a storage shed near the patio for outdoor gear like bikes. One half of the storage shed is for the tenants of the primary dwelling and the other half is for the ADU. The fence runs to the middle of the shed so both houses have the shed in their own yards! Clever idea, isn’t it? 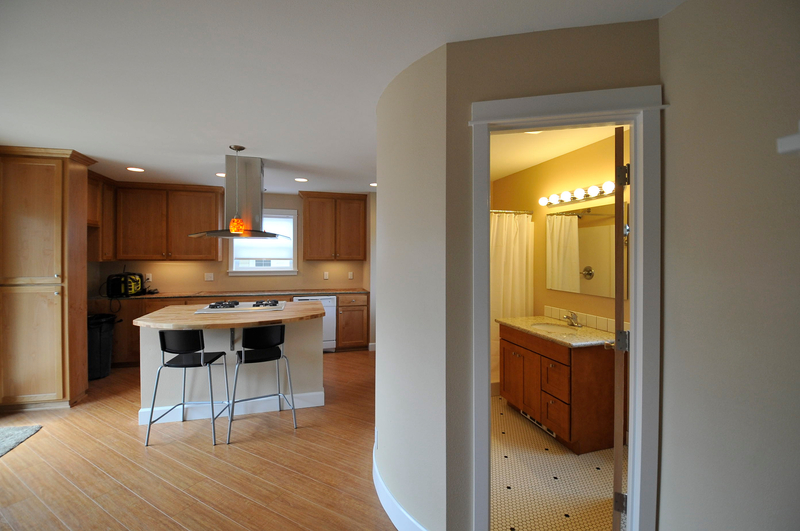 This entry was posted on January 17, 2014 by linamenard in 600-799 SF, Alley, Case Study, Detached, Floor Plan, New Construction, Projects and tagged alley ADU, curved wall, Rainbow Valley, rent both ADUs, rental, Stephen Williams.